There may be hope for another Earthbound game yet. 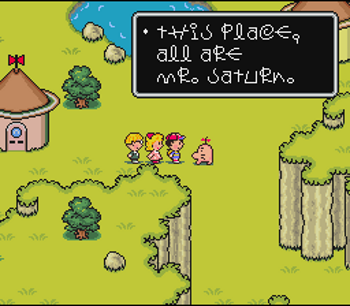 The completely unique Mother series of RPGs, known as Earthbound outside of Japan, has a voracious following despite a lack of official localizations. Earthbound for the SNES, or Mother 2, is the only title to make it to the West out of three, the others having been released on the NES and Game Boy Advance in Japan. Fans have been holding out hope for a Mother 4, perhaps released on modern machines, and though creator Shigesato Itoi says he'll never make it, Nintendo president Satoru Iwata hints that it could happen someday. In an issue of Japanese magazine Brutus, Itoi and Iwata got together to discuss Mother and a possible Mother 4. Itoi plainly said: "I'm not going to release a Mother 4; Mother is over now." Itoi talked about his motivation in creating Mother, calling the series a "letter to his daughter" who he couldn't be in contact with for a while due to divorce issues. In Mother, the character saves by calling his father on the phone, and his father guides him through the adventure from afar. "Looking back at the Mother series, I feel like I had a reason for making Mother 1 through 3," Itoi revealed. "But now my kid is all grown up." It's not that Itoi doesn't feel a need to create more Mother games, but he wouldn't mind handing the series off so he could be the player this time. Iwata doesn't deny this possibility, saying: "I don't believe there will be any new Mother games made using the same production system as before." These words aren't a confirmation of anything, but they do give the Mother series a chance to come back in some form rather than completely ruling the possibility out. If it doesn't, there's always that fan project, though getting to experience Mother on perhaps the 3DS would be out of this world.